I did complete a one week mobile phone detox earlier this year by accident and yes, it really makes you value your phone and what it offers. This video looks at people not having their phone for a week and the impact it had on them. A number of them said they focussed better without it. I didn’t find that to be the case because I am very focussed anyway and when I did not have my phone it created some interesting scenarios but did not interrupt my life because I am not phone dependent. The ease of living is what is highlighted. The ease of being able to contact others. I was brought up in the era of if you don’t have it you make do and mend and do without. In Adelaide we have had constant and prolonged interruptions to our new, electric train service over the last 4 years. At the beginning it was for over a year. Then there were outages to repair problems and then interruptions because of other problems. We have had to learn to do without and find the work arounds . It has also given us an appreciation of what we have. We have also lived without our Expressway. I think that is the point of any exercise like this whether it is planned or accidental. It forces you to notice the value of something in your life. It forces you to practice the art of noticing so you can understand better how to make the most of something. It also forces you to be inventive in your solutions so it is keeping your high level skills working. No one learns to sail on a calm ocean. Disruptions gets all those cogs working and then you need fine weather to really build on those skills and your newly acquired knowledge. In some schools in France they have tried a one week technology detox at home and at school and everyone has fed into the reporting back so they can understand better the positives and negatives of technology. It creates natural debate around the top as this video does. We live in a world full of technology. We need to understand it. I have appreciated the fact ACARA has put all of its curriculum materials online and has consulted widely with stakeholders to ensure its website is functional and workable. I remember at one stage ,when it was all being developed , it was with a sense of celebration that we actually had managed to find the current version of the document we were looking for! Yes, it had been a team effort at a faculty meeting I was chairing and it was the preservice teacher who won that challenge. Since then it is has worked more effectively because a number of the curriculum areas are now settled. I really like the notion of general competencies because in a national curriculum we ought to be looking at things which are common to us all and all learning areas and developing those basic blocks of knowledge. We do want students to be literate, socialised, digitally competent, aware they live on a globally connected planet and that diversity is our strength and so forth. Having this material so easily accessible online is helping us to create common ground and because ACARA comes on Facebook and Twitter it is easy for us to engage with them and know what they are currently doing. That kind of information is important. Teachers need to know that this is real and happening or there is always the tendency to slide off into a local bubble. ACARA is encouraging us to think digitally and nationally by being present online. Sharing and consulting is setting a good example and will ensure we do have consistency across states. It isn’t that easy because it requires a different perspective and constant input. Technology allows the drip feeding to occur! It also means we can address issues more effectively. ACARA is very approachable because it is visible and not some vague organisation somewhere thousands of kilometres away. There is also an ACARA iPad app and that has been a very useful addition to the ACARA digital tools and presence. We have no credibility as a 21st Century technological society if we keep having to charge our gadgets and if battery life is totally insufficient for the work days we have, the lives we lead and the things we need to do. A device which goes flat is completely unacceptable and destroys any cool technology image we might wish to promote. One thing which seems achievable is that schools, businesses and homes could have solar powered USB chargers at a small cost. Adam Codner from the University of Minnesota developed one as a project and has shared the information on YouTube. There are other videos which show you how to make 4 battery USB chargers for a reasonable cost and there are commercially available ones. Solar powered USB chargers for mobile devices should be everywhere so no one is left without battery life and no one is having to protect themselves from the high costs of electricity usage if everyone charges their device. There are written instructions for a small solar powered USB charger on instructables. I am not sure what happened to the paper batteries I blogged about in 2011. They would ease the costs and battery crises and be more sustainable. We have to stop this dependence on batteries so that we can freely use our devices. It is not so easy with laptops. They need more resources to charge and portable solar powered units to charge them seem to be less reliable and a bit of a problem in terms of sustainability and reliability. The comments under this article on treehugger promote some good discussion. The point that a laptop really should not be where there is no real access to power is probably valid but not helpful for those who do have to work in remote areas for a living or research. Spare batteries seem to be the best solution for now and laptop batteries are not cheap. The other solution is that in an organisation where people are laptop dependent, there should be access to electricity which is fed into the grid sustainably through wind and solar panels etc. We have to make the renewable energy solutions promote a more viable option to support our device dependence. We keep ignoring it, but it is not going to go away. They used to have cars where you had to crank up the engine to start them. That was hardly fine living , either. Eventually they gave the world starter motors and alternators.Personally, I want a want to tap my devices so they are then charged. The wand could then plug into a charging unit or be totally solar powered. Far more convenient than having my device connected to the wall or a solar unit. Where would we be without gamification? I have just used the STEAM acronym and tried to find three indicators of each which start with the same letter to be indicative of meeting the component in lesson planning and delivery. This is a work in progress. 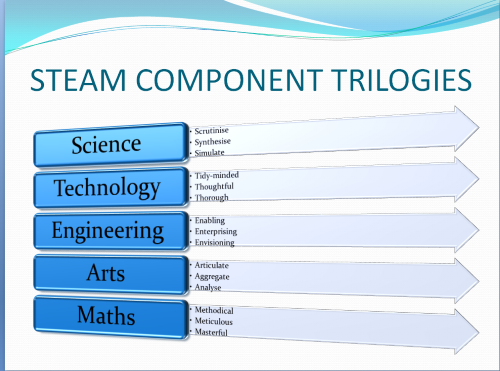 It is not definitive and I have shared it so that others can be encouraged to break down the components of STEAM (Science, Technology , Engineering, Arts, Maths) into an applied model which is easy for teachers to consult as they think and plan. We need something like the Bloom’s Taxonomy – a STEAM Taxonomy to pin us all down and get us thinking in a more consistent fashion. I have a mix of verbs and adjectives. I’d prefer one or the other so that is my next challenge. Just throwing it out there. This meme is so me. I am famous for the fact I do not let students pack up before the bell and I don’t let the bell dismiss them. As we go through our ritual greetings , we also go through our ritual farewells. I use memes sometimes to lighten the lesson or to reinforce my routines. I also use them to focus on something very specific in learning, rather like one cartoon frame focuses on something specific. It can be a good content starter. This week one of my classes will be making a meme because we have been learning the future tense and the meme will focus on one irregular verb and a common use of it. We can then move on to something more complex. Memes have become so popular they are being used commercially and there are aspects of that which can cause problems. Memes may have copyright attached to them. Fair use is deemed okay, but be careful. Also be careful because there are sites with memes which will download unwanted and unpleasant files onto your computer. That is just how the world is and we should have a central reporting agency . Every browser should have a button to click which reports sites with malware. It would make it safer for us all. In the meantime make sure you have good malware and virus protection. There has also been research on memes because they are transmitters of potted culture. Memes are passed from person to person. The popular ones represent what people see as important or a valid perception in some way. One study has found popular English language memes contain more men than women and the men are Caucasian. We need to get some better teacher memes. This one comes from a set of “unhelpful” teacher memes. I don’t see myself as unhelpful when I want my class to work until the end of a lesson. Maybe I am?